To use Export or Bounce (to disk) functions in Logic Pro, select the Logic Pro File menu and then chose Export or Bounce at the bottom of menu as shown on the left below (for Logic Pro 8). You should be familiar with the various options and settings required. For use in Revoice Pro, the we recommend outputting to .wav or Broadcast Wave File formats in mono or stereo PCM. In the Bounce menu (shown for Logic Pro 8 at the right) there are several options that must be set correctly, such as PCM in Destination and Wave in File Format. Resolution, Sample Rate and other settings are up to the user. 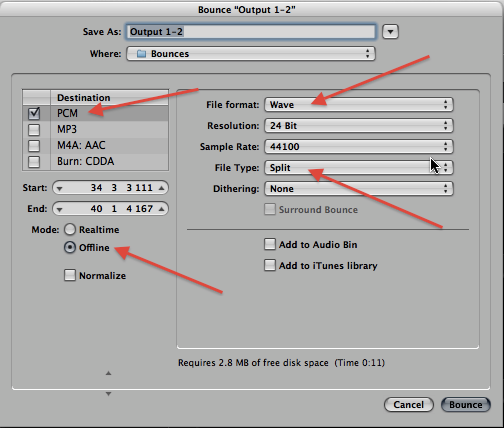 File Type: Split is useful for generating files that will go to separate Revoice Pro tracks. Additional options such as Mode: Offline (instead of "Realtime") will often render audio files in significantly less than real time.